Today, I am linking up once again with Farley from Oh' Boy 4th Grade for her monthly Currently! Thank you all for being such fabulous followers! 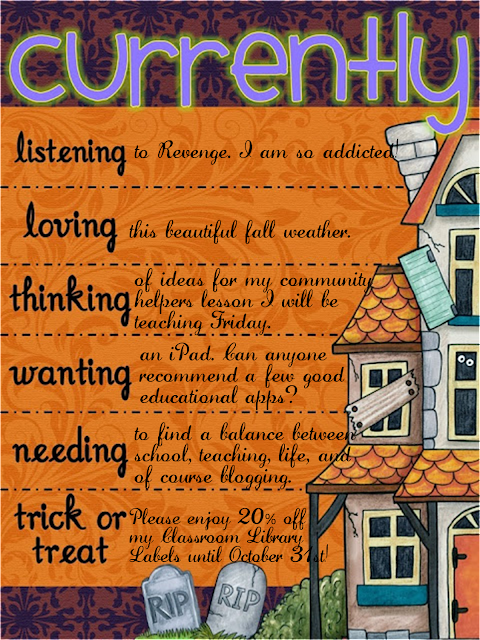 Please enjoy 20% off my Classroom Library Labels until October 31st. Hmmm, a balance between teaching and life - that is a TRICKY one! In my 8th year, still trying to figure this out, but it is getting better! And I agree about the weather... it's been an awesome fall so far! Oooo I haven't watched this week's Revenge yet! Must do! What a nice treat you left everyone! Thanks for letting me visit your blog! I enjoyed reading your currently. Your blog is really cute! I can't wait to read more post! Thanks for sharing!! Hi Lauren! I LOVE Revenge too! I'm trying to finish watching season 2 on netflix, but I can't find the time! Imagine that!? I'm needing the same thing you are! I keep saying I need an extra day in the week! Congratulations on being featured this month, Lauren! Love your classroom library labels! So fun! Revenge is also my guilty pleasure during the week! LOVE that show! I would kill for Emily's wardrobe! She always looks so perfect! I love my ipad! So many educational apps though. I check appsgonefree daily. I have gotten some amazing free ones from there. I LOVE Revenge! I am having a giveaway on my blog. Come check it out!